We train them, we fear them, and we mother them. These fictional beasts have captured our imaginations. I have liked dragons my whole life. While other little girls put up pictures of movie stars and rock stars in their rooms, I had posters of dragons. I still remember the first time I saw Maleficent turn into a dragon. I was awestruck. She was so amazing. So cool. I was hooked and a bit miffed when the prince and three fairies killed her. He introduced me to Tolkien, D&D, and all sorts of other dragon adventures. For someone that had never really known about any of this, it was like seeing a new world. It was my first forray into high fantasy, and I’ve never looked back. I devoured everything I could get my hands on, but that was mostly books. If there was anything on the screen, we had to settle for cartoon dragons. It wasn’t until the advent of good, okay really good, CGI that the Smaug of my imagination made it to the big screen, or at least close to the Smaug of my imagination. And CGI gave us Drogon, Rhaegal and Viserion. Makes me wonder what they could do with the Anne McCaffrey novels I read in my youth. 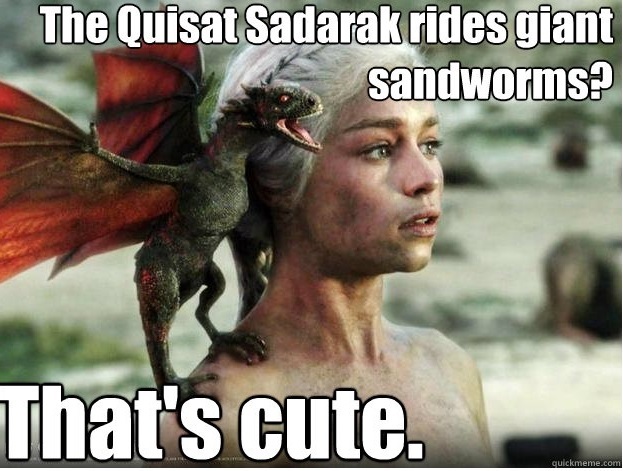 So why do we love dragons so much? There are lots of reasons. Here are the six main reasons I love dragons. 1. Flying Mounts – Yes, you get to ride them. Into battle. They might be as large as a house or the size of a mountain. Doesn’t matter. I can’t think of a cooler ride. 2. Power – Dragons are frequently depicted as strong and powerful. Much like the alpha male trope, just scalier. If you are writing a D&D adventure, the dragon is always the end-boss. 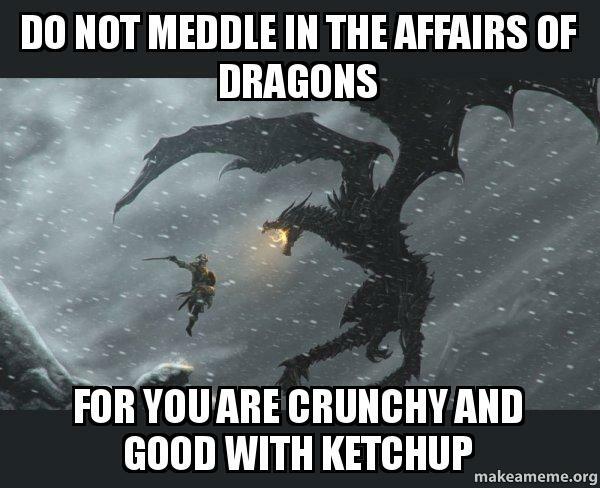 If you’re playing a video game, the dragon is that unbeatable end boss that an NPC can call a false diety with a straight face. 3. Magical – whether casting spells, deflecting them, or breathing fire, dragons are inherently creatures of magic. This feeds back into the power of point 2 above, but it’s more than that. There is nothing mundane or boring about a dragon. 4. Ruthless – Dragons play by their own rules. They are going to achieve their ends, even if it means centuries of manipulation. They are not bound by the concepts of good and evil as mere mortals are. 5. Ancient – whether an ancient force for good or evil depends, but there is an ancient wisdom and mysticism to them. 6. Epic – a dragon promises an epic story. Little things like armies do not slow them. They are the ultimate ally or the greatest foe. You can’t introduce a dragon into a story in a small way. There is nothing mightier than being the Dragonborn, Mother of Dragons, or Dragon Rider. What do you think? Do you love dragons? Why or why not? What were your favorite ones?